Sample shown on White stock with Silver ink and Midnight Navy envelope lining. Sample shown on White stock with Silver ink. 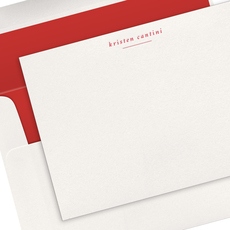 Set flat note cards personalized with your name using typestyle of your choice. Your choice of paper weight. Cards measure 6.25" x 4.5". Matching blank envelopes are included. Your choice of ink color. Envelope lining and printed return address available. Positioning only as shown. Horizontal line design will always appear under personalization as shown.